A pair of Wildcats sprint off the line at the start of a race. NU’s season is over, but the team is still training with the hope that this time next year, it will still be competing. In their final competition of the season, the Wildcats placed 23rd out of 32 teams Friday in the NCAA Midwest Regional Championships held at the University of Kansas-Lawrence. Senior Elena Barham paced the Cats for the fourth race in a row, finishing the 6-kilometer course in 65th place out of 223 runners with a time of 21 minutes, 41.0 seconds. 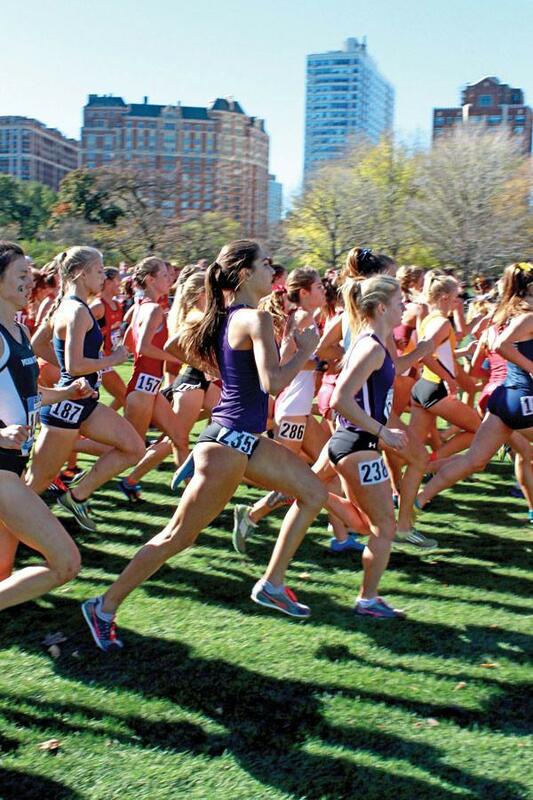 Classmate Rachel Weathered finished behind Barham in 22 minutes, 13.7 seconds, and sophomore Sara Coffey rounded out the top-three Northwestern finishers with a time of 22 minutes, 33.9 seconds. Though the team’s goal was to finish in the top half Friday and it missed that spot by seven places, coach ‘A Havahla Haynes said the top three runners and junior Elena Miller, who finished fourth for NU, all raced particularly well on an individual level. With her first season as head coach of NU’s program in the books, Haynes said there are plenty of positives despite missing some key goals throughout the fall. With two key runners, juniors Jena Pianin and Andrea Ostenso, injured for a good portion of the season, the Cats did not have the depth to reach some of their goals in the competitive postseason meets. With these women out of commission, several underclassmen were able to gain the experience Haynes says will help the team be more successful in the coming years. The Cats will continue to train this week as if they are competing in the NCAA Division I Championships, which will take place on Saturday at the University of Louisville. Though NU will not be represented in the race, with individuals or as a team, Haynes said she wants her athletes to experience the entire length of the season and be prepared to compete late into November, provided they do qualify in the future.